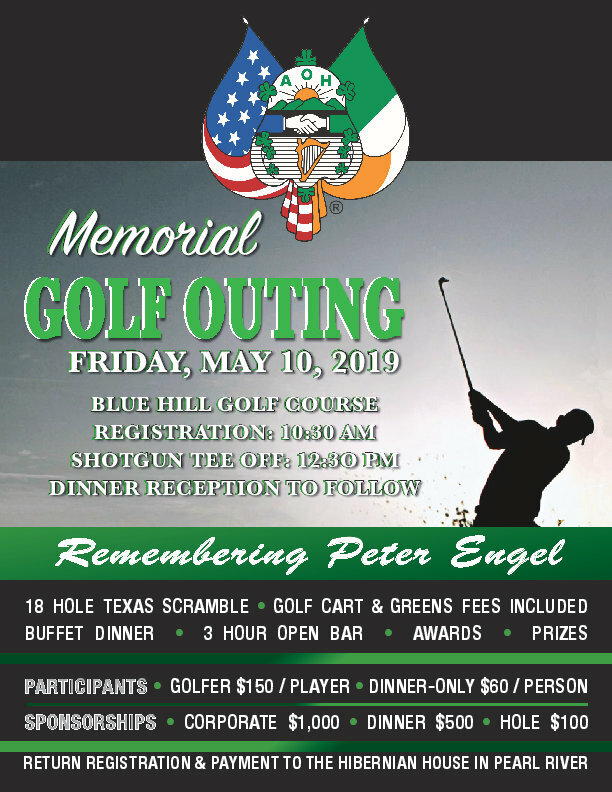 The Ancient Order of Hibernians, Division 3 of Pearl River, New York annual charity golf outing will be held on Friday May 10, 2019 at 12:30 P.M., registration begins at 10:30 A.M., at Blue Hill Golf Course in Pearl River, New York. For all those who cannot make the golf day, come join us for a social evening of dinner, laughter and comradery at The Castle at Blue Hill at 5:00 P.M. that evening. During this year’s event we will honor the memory of our friend, fellow Hibernian and beloved member of the Rockland County AOH Pipe Band, Pete Engel. While Pete has passed away, we remember his kind soul, giving heart, witty humor, and dedication to the Irish and Irish-American traditions and culture. This year’s AOH Division 3 Memorial Golf Outing will be a time of remembrance and celebration of Pete’s life. As always, the goal for this golf outing is to raise funds to support the many charitable activities that the AOH, Div 3 sponsors throughout the year. The gratitude of our college scholarship recipients, the enjoyment of the senior citizens at our holiday luncheons and the happiness on the faces of the kids at our Christmas party for children with special needs are just a few examples of the priceless results made possible by your generous support. We hope that you will help us make this event a success by sponsoring the event or participating in the day’s activities. Please review the registration form which details on signing up and sponsorship opportunities HERE. We thank you in advance for your consideration in contributing to this organization. Your support truly makes a difference in lives of so many!